BRIEF SYNOPSIS: In an alternate 20th century after the Great War, Fallen Angels and those tied to them struggle to maintain their precarious positions, and themselves, in a ruined Paris. PROS: Beautiful writing; well drawn characters; ornately baroque world. CONS: Some aspects of the setup, political and otherwise, are unclear; pacing is sometimes a bit stately. BOTTOM LINE: A deep, dark, wondrous look at an alternate Paris and the fallen angels that strive to maintain their position, and themselves. Fallen Angels, a post-Great War Apocalypse Paris, and a small group of characters caught in the gears of change and chaos populate The House of Shattered Wings by Aliette de Bodard. Known for her Aztec Mystery novels, and her Dai Viet space stories (including On a Red Station Drifting) , with The House of Shattered Wings, the author introduces us to a new series and a new universe. The world and milieu of The House of Shattered Wings is ours in the large scale and details. It is some time after a Great War early in the 20th century, and Europe is slowly trying to rebuild. The War was an apocalyptic one, one that devastated the city of Paris. The Seine runs black, Notre Dame is a shell, and the city is a dim shadow of what it once was. de Bodard’s Paris is marked and controlled and dominated by a number of noble Houses that, even in the wake of the Great War, still dominate the political landscape. By the way, these noble Houses are not run by and for humans. No, these Noble Houses that still stand above the ruined landscape after the war are the edifices and power bases of fallen Angels. Now, with House Silverspires, the greatest of the Houses of Paris, is teetering on the edge of a fall, and a shadowy force threatens not only to push it over the edge, but plunge all of the Houses of Paris, and the rest of the city, into darkness and final destruction. 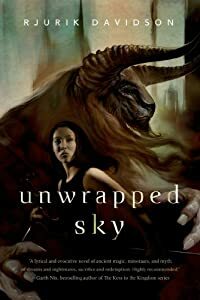 Into this strange alternate fantastical history and plot, de Bodard, inserts an intriguing set of characters. It’s as if she were constructing an Ars Magica RPG campaign; the book has two levels of characters through which she explores her world and develops the narrative. In the highest ring, we have the movers and shakers like Selene, the head of House Silverspires,and other power brokers of the Houses of Paris. In the echelon below them are our main point of view characters that we spend the most time, and it is these characters that are the heart of the novel: Madeline, a tormented, addicted but talented alchemist and Isabelle, a newly minted fallen angel, powerful in her youth, and naive and untrained in her power, so freshly cast from Heaven. Finally we have Philippe, who is originally from Indochina and is cast adrift, a stranger in a strange land, with abilities and a position very uncertain in a world where he is not a Fallen Angel, or a human, but rather something else. The author’s care and steady hand for characterization renders all of these very different protagonists extremely well, and they come to vivid life, as they interact with each other, their superiors, and the half-ruined world around them. My favorite character, however, that I glommed onto immediately, is Asmodeus, one of the antagonists in the highest echelon, and the head of House Hawthorn. Heroes and Protagonists are the foundation of a book, a world and a series. However, a richly done antagonist makes heroes and protagonists all the more striking and can take a life of their own. In Asmodeus, the author has created a character I want to know more about, and whom I want to see face off against the protagonists in future volumes. The ruined city of Paris takes a life all its own. From the ruins of Notre Dome, now part of House Silverspires, to the mean streets of the once-great city, every setting and location is invoked in vivid detail, and a very dark world is brought to life. My only real criticism of the book is that it’s not clear how and why the sociopolitical setup IS so close to ours, with these noble Houses dominating the landscape, figuratively and literally. When did these Houses appear? How did that confrontation between the Fallen Angels and the humans play out? Why has subsequent culture remained so close to ours? I want to know much more about the world and how and why it came to be, and hope to learn more in future volumes.